IN UN CLIMATE talks in Katowice, Poland delivered a milestone rulebook for the Paris climate treaty but failed to dial up national efforts to slash carbon emissions. The 195-nation pact calls for capping the rise in Earth’s temperature at “well under” two degrees Celsius and 1.5 degrees if possible. After a sobering UN report in October showed the need for slashing greenhouse gas emissions by nearly 50% by 2030 to cap global warming at 1.5 degrees, the world – and especially poor countries already reeling from climate-addled extreme weather – looked to the UN talks for a sign that nations would ramp up voluntary carbon-cutting pledges. Even if fulfilled, these promises will see temperatures rise more than 3 degrees above pre-industrial levels, a recipe for global chaos, say scientists. On current trends, the increase would be higher still. The binding decisions assiduously avoid a clear call for higher ambition in reducing greenhouse gas pollution before 2020, when the Paris Agreement becomes operational. Parties to the 195-nation talks could not even agree to “welcome” the findings of the Intergovernmental Panel on Climate Change (IPCC) report on 1.5 degrees, as urged by at-risk nations. The Paris Agreement guarantees smaller developing countries – historically blameless for global warming – €88.5 billion per year starting from 2020 to green their economies and cope with future climate impacts. The rules also enjoin rich nations to boost support over the next two years, and provide hard data on where future financial flows will come from. Climate-vulnerable nations were also hoping to get some visibility on what happens after 2025, when the €88.5 billion pledge expires, as well as on vaguely worded commitments to provide a separate stream of money – under the heading “loss and damage” – to help cope with climate impacts here and now. The run-up to Katowice saw a new round of pledges, including €1.5 billion from Germany and €500 million from Norway for the Green Climate Fund. The new decisions also allay some of the concerns about the opaqueness of future financing – though not after 2025. Nations pressing for urgent action also sought language in the final “COP decisions” that would highlight the need to boost financing beyond climate-specific sectors such as the development of renewables or efficiency improvements in buildings. Facing down the existential threat of climate change also means “making finance flows consistent with a pathway towards low greenhouse gas emissions and climate-resilient development” across the entire global economy, the Paris Agreement says. 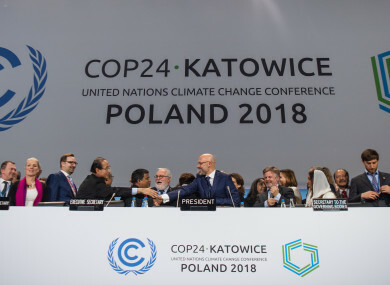 The complicated Katowice decisions will give cover both to nations that seek to expand the climate imperative as broadly as possible, and those who prefer a narrow interpretation, experts said. Following the conclusion of the talks, Minister for Climate Action and Environment, Richard Bruton, said Ireland is fully committed to implementing the Paris Agreement. My experience there highlighted the urgency of the work we are doing at home. The decisions we take now will define the next century. We must step up our response across the board, including all corners of society in facing up to the challenge we have before us. “These talks were a significant milestone. International co-operation is crucial if we are to respond to this global challenge,” Bruton said in a statement. Bruton added that he aims to implement a cross-government plan to respond to climate change, working to develop new initiatives across a range of sectors. We will identify actions with clear timelines and the steps needed to get there, and assign clear lines of responsibility for delivery. Email “UN climate summit: The three key outcomes you need to know ”. Feedback on “UN climate summit: The three key outcomes you need to know ”.